The painting, a reproduction of a worldwide venerated eighteenth century masterpiece by the celebrated Kishangarh painter Nihal Chand in Rajasthan and the prestigious theme of one of the postal stamps issued by the Government of India in 1973 in recognition of its rarity, represents a young lady who combined into her being rare beauty and far rarer style of adornment and turned into a legend of a fashioned woman known in domain of art and even beyond as ‘Bani-thani’ – the well-adorned fashioned or the most idealised. The painting reproduces, though on a miniaturised scale, with great minuteness the earlier eighteenth century proto model – a larger painting, both in form and spirit revealing the same lyricism, transparence, fluidity of lines and magic of form especially the eyes. A contemporary work, it breathes the classicism of an era and a place where brush combined with mundane form of beauty the divinity of the realm of gods perceiving Radha in a courtesan’s form, and in the courtesan, the divinity of Radha. Though an idealised version of feminine loveliness and a form so strange to be real : an elongated face and as much elongated neck, almond-shaped but too long eyes with delicately carved eye-brows curving like a bow and drooping eyelids, a fastidious nose, relatively tiny thin lips and a protruding pointed chin – all so unusual and imagined-type, the painting is contended to be a real portrayal of a courtesan, who besides being distinct, astonishingly beautiful and charismatic, was a gifted singer and talented poetess at the Kishangarh court attending upon the step-mother of Raja Savant Singh, not so much a successful ruler as a great soul to have a life-tenure from 1699 to 1764, all full of upheavals except in his unshaken devotion to Krishna and in his love to the woman portrayed as Bani-thani. Savant Singh was himself a distinguished painter with a keen perception and rare imagination, inspired musician and far greater poet writing under the name of Nagari Das : the slave of Lord Krishna one of whose epithets was Nagara, and a far far ardent devotee of Krishna and the believer of Vallabha’s ‘Pushtimarga’ cult. He is said to have a natural love for this courtesan, to have married her in the last and to retire with her to Vrindavana for the rest of his life handing over his state in the custody of his son. It is widely believed that in his narrative poem named Bihari Jas-chandrika while singing of the beauty of Radha Savant Singh sang of the bewitching beauty of his mistress, and it was from this depiction of her that the most talented painter of his court Nihal Chand drew his inspiration, imagery, lyricism and vigour when he delineated the beauty and charms of the woman : his ideal of feminine beauty, who is now known as Bani-thani. 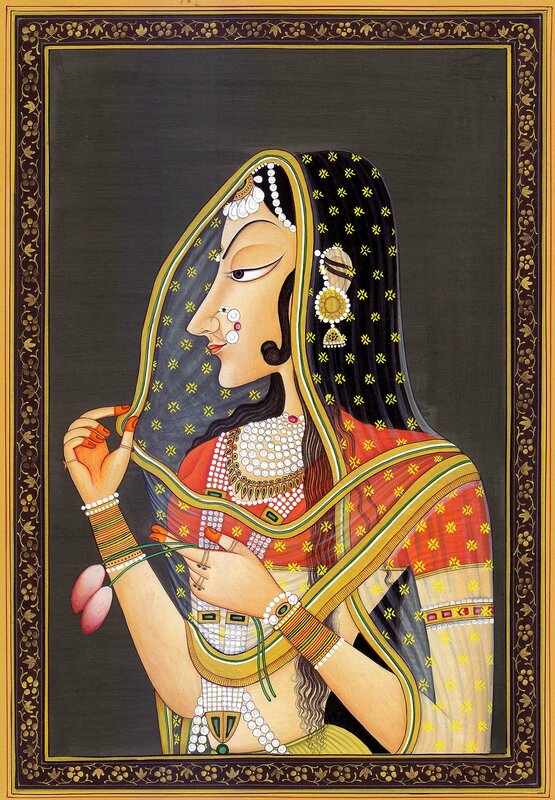 The portrait of Bani-thani, the model of ideal womanhood rare in beauty and as rare in her inner qualities that almost all painting styles of subsequent period in Rajasthan followed, is unique in blending into its form lyricism and rhythm, the characteristics of poetry that it seems to have inherited from Savant Singh’s poem Bihari Jas-chandrika. As exemplifies this portrait which discovers Radha’s divine form in a courtesan, Kishangarh art excelled in discovering elegance and sublimation in common things scattered around. Whether Radha, the object of Savant Singh’s worship, or that of his love, a courtesan serving at his court, Nihal Chand has produced in her form the model of a seductively charming but as much modest woman in a demeanour of elegance represented with her face covered with a muslin ‘odhani’ and with deep thoughtful eyes, graceful costume and rich but elegant jewellery.